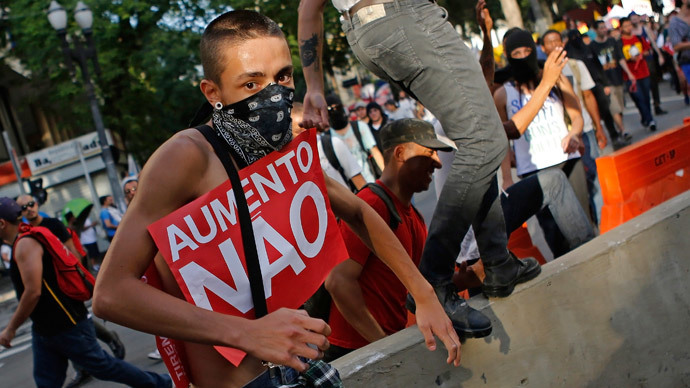 A massive rally against a bus fare hike has turned violent in Sao Paulo, Brazil. Shops were pillaged and objects thrown, with riot police resorting to tear gas and rubber bullets. This is the first such incident since the World Cup protests this summer. Thousands of people chanting “Freedom now” marched through Sao Paulo’s downtown on Friday and police started firing tear gas to stop them from entering a major thruway. Police estimate the crowd was 2,000 people strong, but local news outlets such as Folha De S. Paulo put the number at 10,000. The organizers of the event – the Free Fare Movement (MPL) estimate the numbers at 30,000. "I came to the protest because transportation should be free. So we can begin to change things and have improvements," Pietro Battiato, 19, one of the students at the rally, told journalists. The majority of the protestors were reportedly peaceful, but some elements became aggressive and are said to have provoked the police. The MPL, however, blames the escalation on law enforcers. “The MPL did not direct aggression towards the police or other acts of vandalism,” representatives of the movement told journalists. At least 32 arrests were made, according to Reuters, with estimates in local press going up to some 50 busts. The increase in bus fares is a touchy issue for many of the poor (and some middle class) in the country. Last time they disputed the measures was in June 2013, when a price rise of R$0.20 (US$0.07) to R$3.20 (US$0.37) was averted as a result. This time, however, the local government wants to increase the fare by R$0.50 (US$0.19). The measure has been in effect since Tuesday. Although public transport fares are not a matter for the main government, President Dilma Rousseff’s team is facing increasing pressure, when the country expects her to reduce prices in key areas affecting the poor. But the ruling Workers Party and its allies are also in a tight spot because of a recent corruption scandal involving national oil firm Petrobras. Their legitimacy is undermined in the light of the tough economic policy they are trying to enact. While chaos was ongoing in downtown Sao Paulo, people also came out in Rio, but only a crowd of around a thousand.